It would eliminate around 50 percent of the shooters, those who in the aggregate would lose you money. The 5-Count can give you far more in comps than your risk warrants and even if you dont run into "rhythmic rollers" or controlled shooters you might be able to get the monetary edge over the casino by taking comps into consideration. The Captains philosophy, as he articulated it in my books Beat the Craps Out of the Casinos: How to Play Craps and Win!, The Captains Craps Revolution and Forever Craps: The Five-Step Advantage Play Method! was that craps could be changed by someone physically altering the probabilities through rhythmic rolling and he discussed why he thought the 5-Count was the best way to locate such shooters. In my 14 years of playing craps the Captains way, I became a true believer in the power of the 5-Count and I have preached the Captains philosophy to any craps player who would listen. 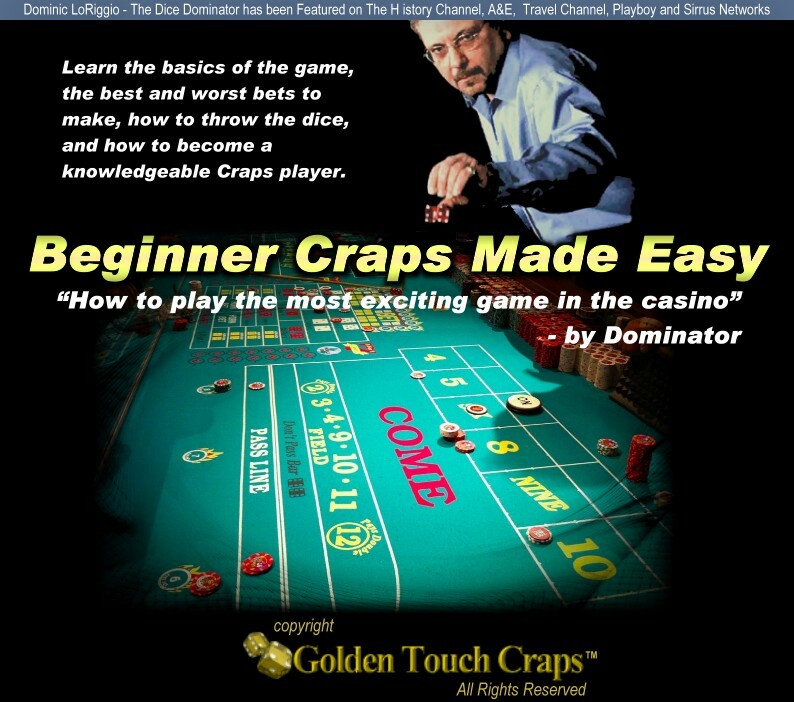 Despite the fact that my craps books have been the best-selling craps books in the world for the past dozen years, few players have embraced the 5-Count, although among intelligent craps aficionados his concept of controlled shooting has gained many adherents, including those whose exploits in the casinos (such as Sharpshooter, Dominator and other members of the Golden Touch™ Craps crew) have become the stuff of legends. Indeed, Sharpshooters book Get the Edge at Craps: How to Control the Dice! is the definitive theoretical and practical explanation of why controlled shooting works and Sharpshooter is quick to recognize the role of the Captain in bringing the concept of controlled shooting to his attention. Still, even many experienced controlled shooters eschew the 5-Count in favor of other types of "shooter qualification" concepts, thinking perhaps that any "shooter qualification" method is as good as any other "shooter qualification" method. There have been two types of criticisms of the 5-Count over the years, one short-sighted and frivolous, the other valid and serious. Criticism #1 concerns the amount of discipline necessary to employ the 5-Count, the fact that the 5-Count can be boring to play as it keeps you out of the action for prolonged periods of time when shooters are going down in flames one after the other, and that it is disheartening when you finally get money up on a shooter only to have him seven out just after the 5-Count. Players who point to criticism #1 as the reason for why they stopped using the 5-Count, or why they never attempted it in the first place, tend to see gambling as a form of entertainment and they crave the action. Its heard for them to stay out of the action for any period of time without getting antsy to bet their money. So they look for other shooter qualification criteria that get them in the action sooner. Criticism #2 is far more serious as it simply puts the 5-Count in the spotlight with a single question: "Wheres the proof?" Those who adhere to this criticism of the 5-Count send out the challenge that if it does what the Captain says it does; prove it. Wheres the math? Where are the computer simulations? What makes the Captains 5-Count method any better than any other method for selecting shooters to bet on, like waiting for them to make a point before betting or hitting a couple of this or that number? All these shooter qualification methods are all just a matter of opinion, period unless you have the proof to the contrary. Over the years Ive used logic and the experiences of players who have used the 5-Count successfully in relatively long-run play (10 years to 25 years) to counter the claims of those who adhere to criticism #2. My personal experience shows the 5-Count to work just as the Captain says it works. There are probably a hundred other people I can point to who will verify that it does work as intended: It selects the best possible shooters to bet on and, if theres a controlled shooter in their midst, youll be on them and in the positive monetary zone. Still, how much proof is that in the scheme of things? For critics, not much. In blackjack, for example, computer simulations of 200 million hands are de riguer for determining the efficacy of this or that move with a given hand vs. this or that dealers upcard. But now, I can safely say that the proof of the Captains 5-Counts efficacy is in and it is incontrovertible. Recent research and computer simulations done by Dr. Don Catlin, Professor Emeritus of Mathematics at the University of Massachusetts, has shown that the 5-Count does everything the Captain said it would, perhaps even more! But first, for those of you not familiar with Dr. Catlins credentials, let me introduce him to you. In addition to being a professor of mathematics, Dr. Catlin, through his company Technigame, analyzes new games that the casinos are looking to put onto their floors. Many of the "new" games that have become popular with the playing public were first analyzed by Dr. Catlin. If you have a question about casino math, Catlins is the first number a casino calls. Dr. Catlin is also a columnist for www.scoblete.com (an archive of his articles can be found at www.casinocity.com). His new book, The Lottery Book: The Truth Behind the Numbers! is the definitive book on state lotteries and must reading for anyone who plays those games. So much for his credentials. Now to his research. We would not expect the 5-Count to show a positive expectation against strictly random rollers; after all, no betting system can change a negative into a positive. Because the 5-Count eliminated approximately 57 percent of the random shooters, this accounted for the fact that the 5-Counter lost approximately $41 for every $95 lost by the Bet-All player in a random game. In fact, the loss for both players is approximately 1.5 percent of the total amount wagered, which is about what we would expect considering the 6 and 8 come in with a 1.5 percent edge for the house. The Captain claimed that utilizing the 5-Count would result in a possible "monetary edge" even against random rollers when comps were factored into the equation. Did this happen? Yes, in most cases the 5-Counter had the monetary edge over the casino. Players Theoretical Loss: 3 percent of all money wagered; comps are 30 percent of theoretical loss. I used the "palatable" figures so that it would be clearer. Players Theoretical Loss: 3 percent of all money wagered; comps are 40 percent of theoretical loss. Players Theoretical Loss: 3 percent of all money wagered; comps are 50 percent of theoretical loss. Players Theoretical Loss: 2 percent of all money wagered; comps are 30 percent of theoretical loss. Players Theoretical Loss: 2 percent of all money wagered; comps are 40 percent of theoretical loss. Players Theoretical Loss: 2 percent of all money wagered; comps are 50 percent of theoretical loss. Players Theoretical Loss: 1.5 percent of all money wagered; comps are 30 percent of theoretical loss. Players Theoretical Loss: 1.5 percent of all money wagered; comps are 40 percent of theoretical loss. Players Theoretical Loss: 1.5 percent of all money wagered; comps are 50 percent of theoretical loss. As we can see, the 5-Counter only faces a monetary disadvantage in casinos that rate the game as having a 1.5 percent to 2 percent edge with a 30 percent comp giveback and in games that are rated 1.5 percent with a 40 percent giveback. The most the 5-Counter is down is $12.50 in the latter game. Can the 5-Count Find Controlled Shooters? The second proposition that the Captain stated was that the 5-Count was the best way to limit losses while waiting for the conscious or unconscious rhythmic roller or controlled shooter to appear. That it acted as a sort of "range finder" and that once it homed in on a controlled shooter, you could make craps a positive expectation. Catlin ran 10,000,000 rounds (which is over 100,000,000 games) and got the following results: Player #1 had an edge of 0.18 percent over the house. Player #1 bet on Player #10 5,632,885 times and on Player #9 5,084,975 times. The 5-Count selected the skilled shooter 10.7 percent more often than it selected the random shooter. While this did not prove that the 5-Count will, in general, reduce the house edge [in this simulation the 5-Counter needed a shooter with a SRR of 1 to 7 to flip it over], the simulation clearly shows that if there is a skilled shooter at the table the 5-Count will select him with a higher frequency than the rest of the players and will thereby reduce the house edge or, as in this case, give the player the edge. The simulation produced wins of $527,947.80 for Player #1 from total wagers of $292,716,290. What would happen to a 5-Counter who found himself at the tables with such controlled shooters as Sharpshooter or Dominator or others in the Golden Touch™ crew sporting SRR of close to/or at 1 to 8? Catlin ran these figures through his simulation and this is what he found: "Reran program with SRR 1 to 8; there were 20 million rounds of play which produced in excess of 200 million games. This time Player #1 was on Player #10 a total of 12,152,952 times while on Player #9 a total of 10,165,524 times. The result was a $6,852,787.80 profit with $596,017,946.00 put at risk. This represents a 1.15 percent return per dollar to the player." Keep in mind that Player #1, who is showing this profit, is not a controlled shooter and does not know that a controlled shooter is at his table. Hes just utilizing the 5-Count as a normal part of his play. Yet, by making good house edge bets, Pass and Come with double odds, he has managed to get a real edge over the casino. Factor in comps now and you can see that he has a rather hefty monetary edge as well. Interestingly enough, when someone is at the table with a SRR of 1 to 7.5, the game is positive for everyone placing the bet of 6 and 8. However, the difference in expectation between the 5-Counter who controls the dice at the above rates and the Bet-All player are profound. The 5-Count dice-controller is wagering approximately half as much money but winning an incredible amount more! Lets take a look at how the 5-Count has created such a dichotomy. Translated into small numbers that are easily digestible, the Bet-All player can be said to wager approximately $6,310 on the 6 and 8 with an expectation of losing about $30 when a controlled shooter with a 1 to 7 SRR is at the table; win $1 when a controlled shooter with a 1 to 7.5 SRR is at the table; and win $32 when a shooter with a 1 to 8 SRR is at the table. Contrast this with the 5-Counter who is a dice controller. If the 5-Counter wagers the same amount of money, that is, $6,310, we can approximate that he will win around $36 when shooting at a 1 to 7 SRR; win about $100 when shooting with a 1 to 7.5 SRR; and win about $160 if his SRR is 1 to 8. Keep in mind that the placing of the 6 and 8 comes in with a 1.5 percent house edge, so the 5-Counter who controls the dice has not only overcome the house edge against him, hes made a nice profit for himself all this at a table with nine other players, all random shooters. Again, factor in comps and the monetary edge is impressive. Dr. Don Catlins massive simulations leave no doubt that the 5-Count is everything the Captain said it was. Its utilization can, when proper bets are made, reduce the houses hit on your total bankroll, give you a monetary edge in the overwhelming majority of comping situations, locate and exploit the rhythmic rollers or controlled shooters who happen to be at your table, and effectively increase your profits and edge when you are the controlled shooter or when you know someone else at the table is. The 5-Count is the only method of shooter qualification that has withstood such simulations and analyses, and come up smelling like, well, like the winner youll be if you use it. And what of the players who say that the 5-Count takes too much discipline to play or that its too boring and can be disheartening at times? They can look at the above figures and ask themselves a simple question: In the simulations above, would you rather be the Bet-All player or the 5-Counter? If you say that you would rather be the Bet-All player, you should not be at a craps table but on a psychiatrists coach! And what of those critics who say that any shooter qualification method is as good as any other shooter qualification method - which is to say there is nothing special about the 5-Count? Just say two words: Prove it.